TOKYO -- Japanese fishermen have finished killing some of the 250 dolphins trapped recently in what activists say was the biggest roundup they have witnessed in the last four years. Sea Shepherd, best known for its anti-whaling activities, said the fishermen first selected 52 dolphins to keep alive for sale to aquariums and other customers. They included a rare albino calf and its mother. Of the rest, about 40 were killed, one became stuck in a net and drowned, and the others were released, it said. A video released Tuesday by Sea Shepherd shows dozens of fishermen on boats surveying the dolphins after they were confined to a cove with nets. 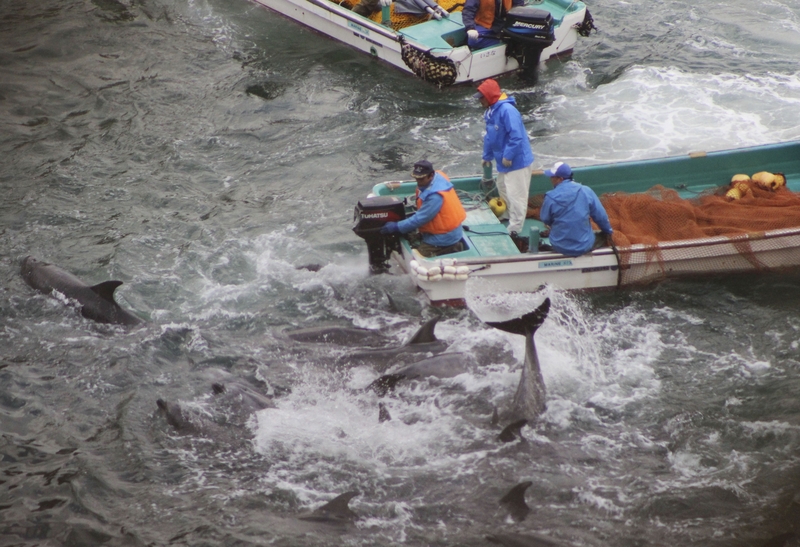 Divers can be seen holding the dolphins selected for sale and guiding them to nets hanging off the boats. While other dolphins have been killed since the hunting season began in September, Sea Shepherd said the 250 herded into the cove last Friday was the largest group it has seen since it began monitoring the hunt. "The dolphins face a violent and stressful captive selection process," said Paul Watson, founder of Sea Shepherd. "Babies and mothers will be torn from each other’s sides as some are taken for captivity, some are killed and others are driven out to sea to fend for themselves," Watson said. The annual hunt in the village of Taiji received high-profile criticism when U.S. Ambassador to Japan Caroline Kennedy tweeted last weekend that she was deeply concerned about the practice. The fishermen say the hunt is part of their tradition and call foreign critics who eat other kinds of meat hypocritical. A Japanese government spokesman defended the annual dolphin hunt on Monday, saying it is carried out in accordance with the law. The hunt was the subject of the Academy Award-winning 2009 film "The Cove."